Bonnie Carlson was skeptical. Making money as a small-town grocer was tough enough. How would selling a local guy's garlic for a premium possibly help her? But she didn't say no when Big Stone County farmer Russ Swenson and Kathy Draeger, a local University of Minnesota expert and customer of Bonnie's Hometown Grocery, pitched a plan to put Swenson's garlic on the shelves at Bonnie's and small-town stores across Minnesota. Carlson, whose grocery is a fixture in tiny Clinton, had already seen demand growing for local food, so she signed on. Now, she and others hope the experiment this summer answers a central question: Will small-town consumers buy healthy, regionally grown food from their local grocer, even if it costs a little more? "It's kind of a unique, interesting way to see if we can do local foods for other stores," she said. "I think people like to look for things like that in little specialty stores like this." Nearly every Minnesota farm town has a grain elevator where farmers sell corn, soybeans or wheat. But what do you do when your crop is garlic, or organic potatoes or strawberries? That's Swenson's dilemma in Big Stone County. There's no ready market for his garlic. 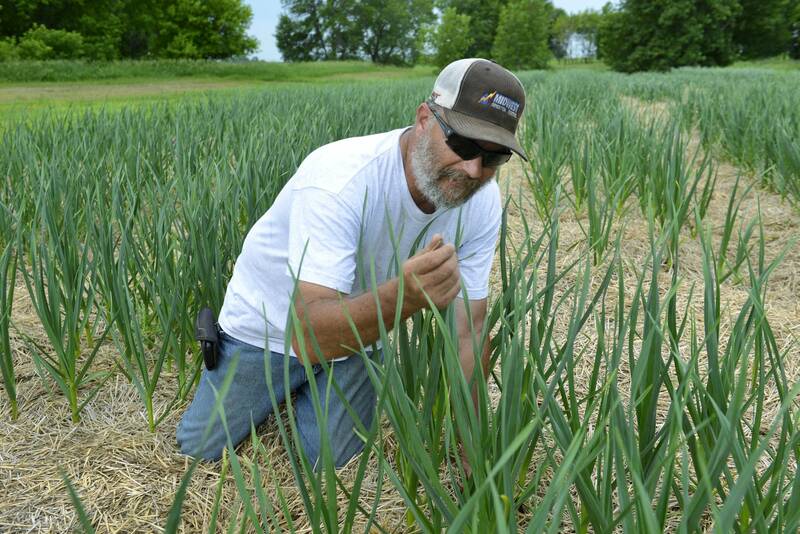 A sturdy, bearded guy who likes to get his hands dirty, Swenson has been growing garlic for six years in that geographical bump on Minnesota's western border. He works for an irrigation company. Growing garlic is a passion. "I do love garlic. I'll eat it raw, or I'll eat it any way," Swenson said during a recent visit to his farm plot as the pungent smell of garlic floated through the air. Garlic is a labor-intensive crop. 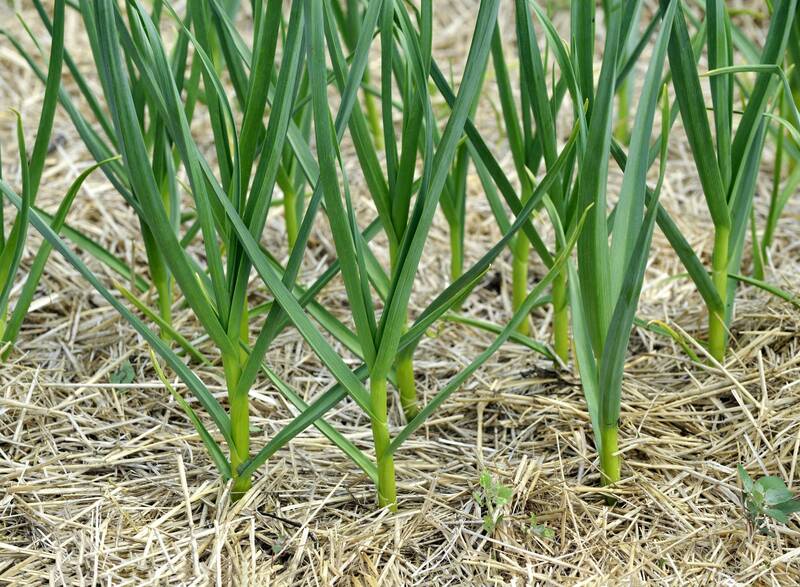 The 18,000 plants in this quarter-acre plot were planted by hand, weeds are pulled by hand, and in about a month, about 800 pounds of garlic bulbs will be harvested by hand, and hung in bunches of 10 to dry. All that work can bring a nice return on investment. "The value per acre is probably at the top end of anything grown in Minnesota. It's about $40,000 per acre," he said. He'd grow more if he could sell it, but that's the challenge. Despite online sales and trips to the Minnesota garlic festival and farmers markets, he's often left with large amounts of unsold garlic at the end of the year. "Admittedly it's one of our weak spots, is the marketing part," he said. "I love being down on my hands and knees pulling weeds, I don't like finding new ways to get my product on the shelves or in people's hands." Enter Draeger, the statewide director for the University of Minnesota regional sustainable development partnerships whose job is to build connections and support local projects in rural parts of the state. 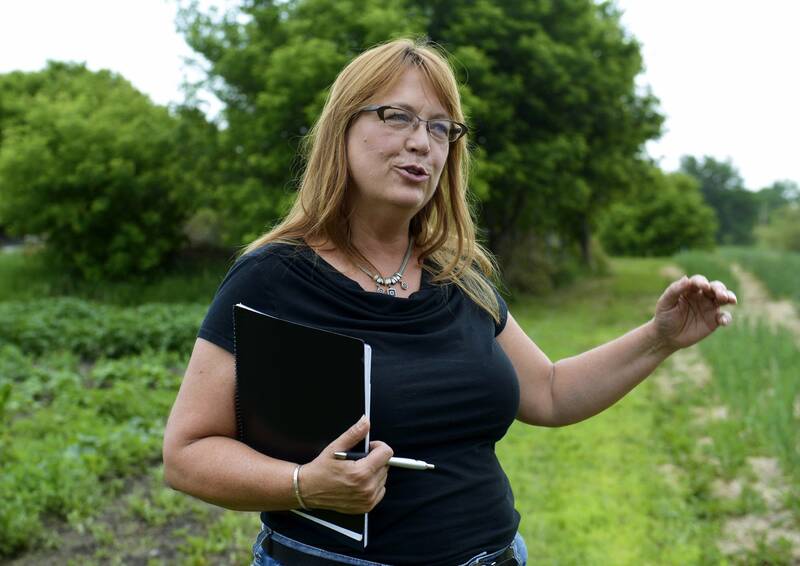 She lives on a farm in Big Stone County not far from Swenson and has been thinking about farm-to-market issues for several years. "What we're hoping to do is re-engage the rural grocery stores as being the equivalent of that grain elevator in that small town," said Draeger, who tapped a $500,000 United States Department of Agriculture grant to get this idea off the ground. Here's how it works. Trucks deliver groceries to small-town stores twice a week. After unloading the groceries, they might fill that space with locally grown garlic or potatoes or strawberries and haul it back to a distribution warehouse where it's put on trucks to small-town grocers across the state. That's what will be tried later this summer with garlic grown by Swenson. "Rural grocery stores are at the end, they're the last place lettuce from California goes in the nation. Same with garlic. It's not high-quality food," said Draeger. "And here's a chance to get high-quality food into these small-town stores." 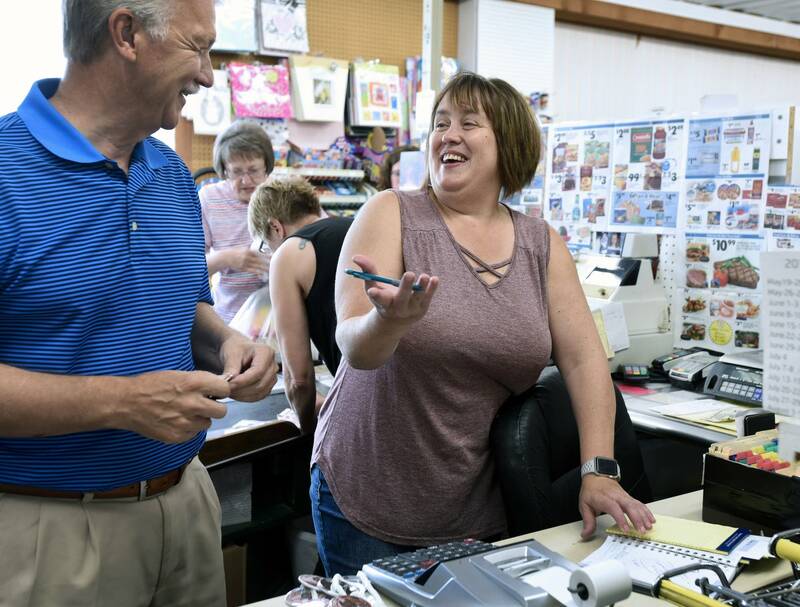 When she moved to Big Stone County from St. Paul a decade ago, Draeger quickly learned the local grocery store was very responsive. She asked for organic milk, and it was in the cooler a week later. 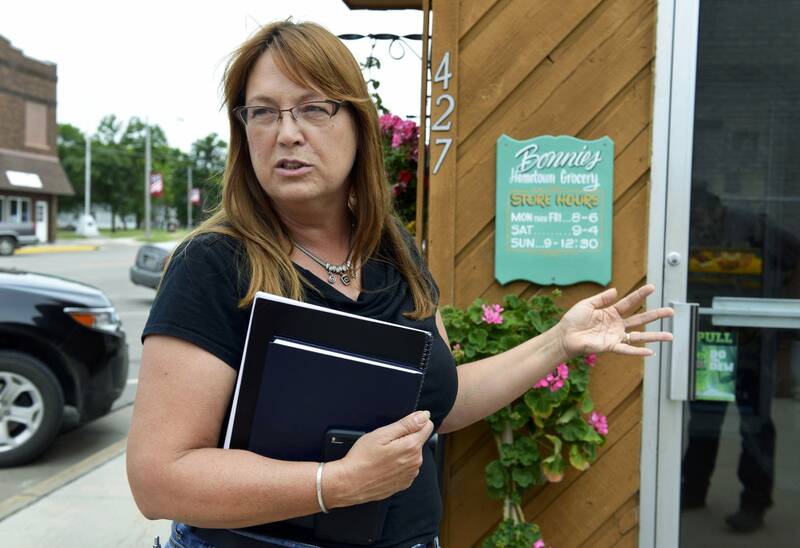 That store was Bonnie's Hometown Grocery, the hub for the pilot project, the place where Swenson's garlic will be loaded on a grocery delivery truck and hauled back to a distribution center in Wadena, Minn.
Economics are the biggest challenge for this project. If Russ Swenson doesn't need to market and package his garlic, he's willing to take a lower price and share some of the profit with the grocery stores and the wholesaler. But his garlic will still be more expensive than the garlic most grocers sell. While some of the pricing information for the backhaul experiment is proprietary, Swenson sells his garlic for $6.75 a pound at farmers markets. USDA says the current national average price for garlic is $2.45 a pound. Hope in the hazelnut oil? Duke Harrison wonders if people will pay more for quality. He oversees transportation and warehouse operations for Mason Brothers, the Wadena grocery wholesaler participating in this pilot project. He doesn't expect his company to earn a profit from hauling the garlic, but he's interested in this project because if it helps local grocery stores it will help his company in the long run. The company delivers to about 250 grocery stores in Minnesota, and some 400 stores in the Upper Midwest. Part of the challenge with this project will be convincing grocers and consumers quality is worth a premium price. Small-town consumers often pay a premium now for low-quality produce because they are at the end of the nation's food distribution network, Harrison noted. "I think the only way we could get to that point is telling a story and creating an emotional attachment to these products," he said. "So, it kind of comes back to connecting people and trying to build that trust and loyalty to these local grocery stores so they keep their lights on." Draeger thinks the logistics of getting the crops from farms to the distribution warehouse will work well. She hopes the crop will go to small-town grocery stores across the state. But the bottom line will be the ultimate measure of success for wholesalers trying to move a crop like garlic. "If they say, 'Look, we can sell premium garlic for eight dollars a pound in St. Paul, but in Hallock we can only sell it for three,' those are some of the questions we have to figure out right now," said Draeger. If the pilot project is successful with garlic, Draeger wants to expand to organic potatoes, strawberries and eventually other niche crops farmers might grow if they had a marketing network. Draeger thinks with some smart marketing, small-town consumers will buy healthy, regionally grown food. She recently did an experiment with Bonnie Carlson after talking to a hazelnut grower who was struggling to market hazelnut oil. "I came to Bonnie and I said, 'if you carry this hazelnut oil I will buy it,' so Bonnie ordered it, stocked it on the shelves," she said. "And then you put out a Facebook post, like 'Oooh, I got hazelnut oil at Bonnie's and I'm using it in my barley salad.' And it all sold."